I recently saw a fun looking manicure by @anya_sobko on Instagram. I've no idea what the technique is called, but after polling a few fellow nail ladies we thought something along the lines of the Mosaic blobicure. The design is actually very quick and easy to create, but it does take a long while to dry. 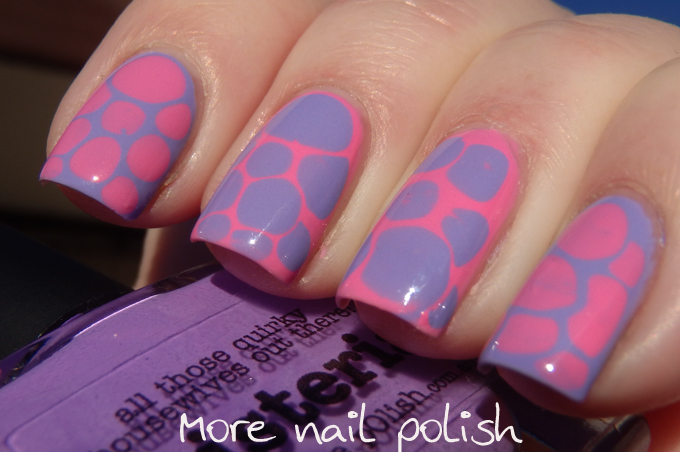 To create the look, paint you nails in the base colour and let it dry. Then, one nail at a time, paint a second thick coat, and while is is wet use a contrasting colour and place gentle drops of polish into the wet base in a mosaic pattern. Because the base it wet, the polish drops will spread, but they will not run into each other, instead they leave a thin edge between each colour. Once you have finished all nails, let then dry about 10 minutes before applying a quick dry top coat. Then after that you will need to not doing anything with you hands for about 30 mins whilst the polish is still very wet. 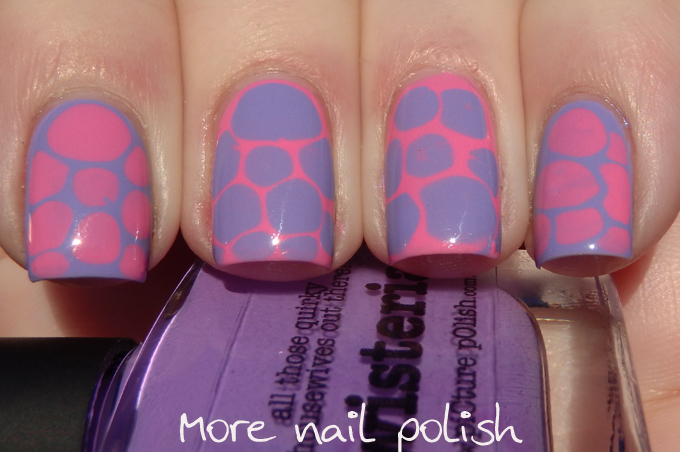 The polishes I used here are Picture Polish Wisteria (original version) and Candy. This is a very cool look and the colors you used are so cute together! I love the effect of the smaller drops you used, making this manicure look almost giraffe like <- my favorite! This looks like a variation of the "drip & spread" technique which from my research was originally done with tutorial by Up Close & Polished (post linked below) - here's her youtube video - https://www.youtube.com/watch?v=oLNnt3nK2oI . I've done my own twist on this in the past too ( http://nail-ineit.blogspot.com/2013/10/opi-black-spotted-returns-to-altantis.html ). Again, I really love the finer drip version, beautiful! This is such an interesting technique! I can think it must have taken forever to dry though!